Jim Hoffer is live in lower Manhattan with the latest details. 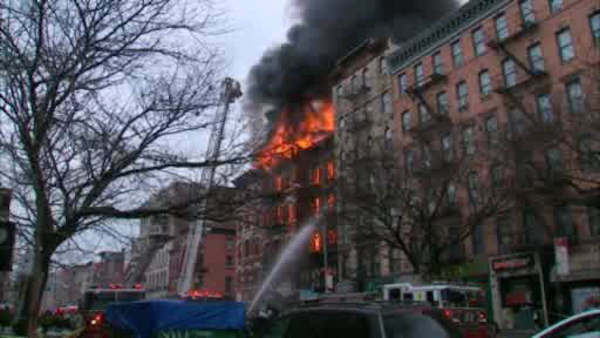 EAST VILLAGE, Manhattan (WABC) -- Five people have been indicted by a grand jury in connection with a fatal 2015 gas explosion in the East Village. The building owner, her son, her contractor and two plumbers entered the courtroom in handcuffs Thursday afternoon to be arraigned for their role in an illegal gas hookup last March that killed two, injured 20 and nearly levelled a city block. "When you tinker with gas and electrical hookups as happened here you have in effect weaponized the building," said Manhattan District Attorney Cyrus Vance. The building owner Maria Hrynenko, 56, of Rockland, her son Michael,30, of Sparkill, an unlicensed plumber Athanasios Ioannidis, 59, of Queens, and the general contractor Dilber Kukic, 40, of the Bronx face manslaughter and homicide charges. The master plumber Andrew Trombettas is charged with falsifying documents that investigators say hid the illegal gas hookup from inspectors, apparently not the first time. "We learned Trombettas provided false information to the city on many jobs and endangered public safety on numerous occasions," said Mark Peters of the Department of Investigations. The DA says seven months before the explosion the group got caught by Con Ed for an illegal gas line made up of leak prone plastic pipe. They were ordered to make it safe. Instead, the DA claims they rigged another illegal gas line hidden in a locked utility room in the basement next door. That's why Con Ed never found it, even though they were there hours before the explosion. While two people died then, we learned Thursday that firefighters trying to rescue people came within seconds of certain death. "We came within moments of losing many firefighters in this incident, so when greed guides people's decisions this is the result," said FDNY Commissioner Daniel Nigro. The top count for the Hrynenkos, Kukic, and Inonandis is manslaughter in the second degree, which carries a maximum sentence of 15 years behind bars. Another plumber, Andrew Trombettas, is accused of illegally providing his license to unlicensed plumber Inonandis. Trombettas is charged with offering a false instrument. The five were arrested by investigators Thursday morning and taken to court. Kukic was the general contractor for construction at the site; and Maria Hrynenko the owner of the building. Hrynenko's son, Michael, the manager of the building, was dragged to safety after the explosion by Kukic. Vance and other officials said that the defendants set up an illegal gas delivery system. Vance blamed the ensuing carnage on "a foreseeable, preventable and completely avoidable gas explosion." In all, three buildings collapsed and a fourth building was seriously damaged. In addition to the two that died, 22 people were injured, four critically. Restaurant worker Moises Ismael Locon Yac and diner Nicholas Figueroa were killed. Officials said Thursday that Inonandis was hired as part of the renovation of apartments above a sushi restaurant at 121 Second Ave. In July 2014, Inonandis illegally ran four flex hoses from the basement of 121 to the apartments to provide gas until Con Edison approved installation of gas meters. "Flex hoses can be dangerous. They are prone to disconnect, break or leak. So it is illegal and highly dangerous to use it for the purpose it was used," said Vance. After rigging the hoses, the apartments were then rented out. Tenants were never told of the illegal gas set up. In August 2015, Con Edison discovered the illegal connection and shut off the gas. The landlord was told to hire a plumber to fix the situation, but officials said Hrynenko built another illegal gas situation by rigging a series of pipes behind a locked door. It tapped a gas meter next door, at 119, also owned by the same landlords. Con Edison returned to inspect, but officials said prior to the inspection, Kukic and Inonandis shut off the illegal gas setup from 119 to hide it. They also opened a series of valves in the basement to pass a pressure test. At 2 p.m. the day of the explosion, Con Edison rejected the installation of a new meter and left. Afterwards, the owners went to the locked room to turn the illegal set up back on so the apartments would have gas again, officials said. But because they never reclosed the valves that they opened during the pressure test, the gas pipes that led to the front of 121 in the basement were uncapped and open. officials said, when the gas from 119 was turned back on, the gas went into the basement of 121, and ultimately caused the explosion. Officials said at 3 p.m., a sushi worker notified Kukic and Michael Hrynenko about the smell of gas. The men responded, that they "went down to the basement, smelled the gas and sprinted out of the building without alerting people," officials said. No 911 call had been made and there was no attempt to evacuate the restaurant, officials said. The explosion ignited in minutes and within hours, the three buildings were reduced to rubble. New York Mayor Bill de Blasio said Thursday that those involved showed a "blatant and callous disregard for human life." "We are heartened that today these defendants will be brought to justice and forced to answer for their criminal actions. New York City lost two of our own in this tragic explosion and New York City's Bravest put their lives on the line to battle this seven-alarm fire<' said de Blasio in a statement. "These indictments will hopefully bring Mr. Figueroa and Mr. Locn's families some closure following this tragic event. I want to thank Manhattan DA Vance, NYPD, FDNY and DOI for their work on this important investigation."